← The Sports Archives – ESPN For Ultimate Sports Lovers! The Sports Archives – Heli Skiing – The New Extreme Sport! If you haven’t already done this then you are in for one hell of an experience… Heli-skiing is when you ski downhill, off-piste, in a natural environment. This is the perfect answer if you’re bored of the regular slopes, want some virgin snow, some thrills and some serious space to yourself. In an era where even the best slopes in the most expensive ski resorts are always crowded you might do well to consider heli-skiing. Heli-skiing is a great option for skiers who want specific skiing conditions. The terrain at ski resorts can often be heavily manipulated, so the chance of skiing long descents on steep slopes, covered in much-coveted powder snow and bordered by natural woods can be irresistible. Very occasionally operations have runs that can reach 10,000 feet in vertical relief, but the usual run is more likely to last about 2,000 feet. This highly charged adrenalin-pumping challenge is rapidly becoming the world’s most popular extreme sport. Although practiced almost worldwide – from the States to the Indian Himalayas, from Nepal to Chile, from Russia to Switzerland – it is B.C Canada which has the most popular area for this sport. Apparently they have the vast majority of the global share. When you go heli-skiing the most important piece of kit you can get yourself is a good guide. They will know the areas able to be covered by the helicopter charter that provide the right kind of snow and slope. Your guide’s in-depth knowledge of the mountains, mountaineering and skiing, will ensure you can relax and have a great time in these challenging off-piste conditions, without having to worry about the trail. They often also have an assistant guide. 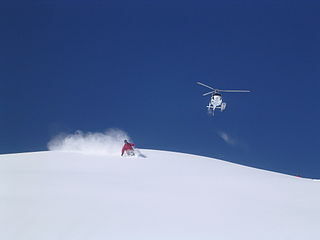 A heli-skiing helicopter charter can fly to the otherwise inaccessible places around the mountains that are suitable for skiing, such as steep chutes and high Alpine glaciers. However, for obvious reasons, the skiing access in many mountain ranges has to be regulated. It would be a shame if the slopes were abused by too many people getting a random helicopter charter to drop them wherever they please. In America and Canada they tend to use their helicopter charter a bit like a ski lift in that the pilot will happily pick up and drop skiers onto the best sections of snow for up to a dozen runs a day. This is known as the ‘Canada Model’. The European version (we’re hardier over here!) is to use the helicopter charter like a taxi. One pick up from the valley base, one drop off at the mountain top, and then the skiers both ski and perhaps even mountaineer a bit in order to get back to base. Once your helicopter arrives it will load passengers, guide, skis and poles onto the helicopter and then the helicopter charter will take them to the designated Landing Zone. Once there, the guide will of course assess the safety of skiing depending on the snow and potential avalanche conditions. Whether you ski together as a group, or individually, or within the guide’s tracks depends on how safe the guide has deemed that day’s snow to be. If you are interested in the idea of heli-skiing then you can travel in style to the top heli-skiing locations in the world via private jet or helicopter charter. The locations are currently thought to be the Canadian Rockies, the Swiss Alps, the Dolomites, the San Juan mountain range in Colorado, Chugach Range in Alaska, Sun Valley in Idaho, the Pantheons in Canada, and the Diamond Peaks in Utah. Have fun but be safe and make sure you use a licensed helicopter charter services for your heli-ski experience. Jump, Run, Ski: Six Sports To Try Before You Die! What Makes Extreme Sports So Popular? This entry was posted in Other and tagged Canada, Extreme Sports, Extreme Sports archives, Extreme Sports Blogs, heli-skiing, helicopter, helicopter skiing, helicopter tours, skiing, skiing equipment, skiing holiday, skiing vacation, sports and leisure, Sports Archives, Sports Blogs. Bookmark the permalink. 2 Responses to The Sports Archives – Heli Skiing – The New Extreme Sport!